Dubai Court of First Instance Judgment: Do the UAE Courts apply foreign law? There is a common misconception that the UAE Courts will only apply UAE law when determining disputes between parties, notwithstanding an agreement to apply foreign law. However, in practice, the UAE Courts do not always apply foreign law. This is mainly because the requirements for its application are not met due to various practical difficulties. These hurdles include, but are not limited to, the requirement that the party requesting the application of foreign law must prove the foreign law’s existence and content to the court as an issue of fact. This requirement is coupled with the tendency of the UAE Courts not to readily accept submitted evidence regarding the content and effect of such foreign law. As a result, the UAE Courts often disregard the parties’ chosen law and simply apply UAE law. This application is not even: the Courts frequently apply foreign law in matters of personal affairs but not in commercial disputes, for instance. In this article, we analyse a recent judgment of the Dubai Court of First Instance (Commercial Full-Bench – Case No. 1484/2016), issued in May 2017, in which Al Tamimi acted for the successful Defendants against a claim seeking to invalidate personal guarantees given by the Claimant in order to secure loans for a group company. This case is interesting because the court was prepared to, and very nearly did, apply foreign law to a dispute to be determined in the Dubai Courts, but only declined to do so on the basis that a complete and certified Arabic translation of the foreign law was not provided by the party seeking to rely on the foreign law. The Court of First Instance also considered in this case whether the conclusion of a contract in a consulate amounts to concluding the contract in the state of the consulate under the 1961 Vienna Convention on Diplomatic Relations. The Claimant argued that he was entitled to invalidate the guarantee deeds that he gave to the Defendant on the basis that he was misled as to the amount of the loans and therefore the value of the guarantee deeds. He claimed that he did not receive the full amount of the loan and therefore was not bound by the guarantee under the provisions of Indian law which he said applied to the loan and guarantee agreements. The agreements provided that the laws of India should govern any related disputes. Sections 5, 19, 39 and 142 of the Indian Contract Act, 1872 provided that any guarantee which had been obtained by means of misrepresentation made by the creditor or with his knowledge and assent, concerning a material part of the transaction, was invalid. Under the Indian Contract Act, when consent to an agreement is given by fraud or misrepresentation, the agreement is a contract voidable at the option of the party whose consent was so induced. The Dubai Court of First Instance referred the matter for investigation, placing the burden on the Claimant to establish the details (including the place and date) of offer and acceptance of the alleged terms in relation to each guarantee, and proof of agreement. Separately, there was also a jurisdictional challenge based on the Vienna Convention on Diplomatic Relations. Even though the facility agreement was signed by the parties in the Indian Embassy in Dubai, and the parties had agreed to the jurisdiction of the Indian Courts to adjudicate the dispute, the Claimant had brought his action before the Dubai Courts. The loan and overdraft facilities were also issued and paid in India in Indian Rupees. The Defendants argued that, because the guarantee deeds were signed in the Indian Consulate, Indian law should be applied. The Claimant responded that, as the legal obligations under the agreements were centred on Dubai and they were physically signed in Dubai, the case should be before the Dubai Courts. The Dubai Court applied UAE law, ruled in favour of the Defendants and held that it was clear that the Defendants did not make a request to the Claimant to pay the full amount of the guarantees. The Court found that the terms of the guarantees were clear, as they complied with UAE law and were not contrary to UAE public order. The guarantees reflected the intentions of the parties and therefore there was no justification to invalidate the guarantees. Furthermore, the Court applied Article 21(3) of the UAE Civil Procedure Law, which says that the courts shall have jurisdiction to consider the claim on the foreigner who has no home or residence in the state if the claim is related to an obligation made or executed in the state or by a contract that shall be registered therein or an incident occurred therein. Article 24 of the same law provides that any agreement in violation of the articles of this chapter shall be void. The Court determined that the agreement was entered into in the “State” and found in the Claimant’s favour on the question of jurisdiction, on the basis of the above provisions. This invalidated the agreement of the parties to choose a foreign court to determine the dispute. The Defendant’s jurisdictional challenge, asserting that the Court of First Instance had no international jurisdiction and that jurisdiction belong to the courts of India, was dismissed on the grounds that the Claimant’s action was for the invalidation of guarantees signed by the Claimant in Dubai (the dispositive fact occurred in Dubai). This meant suing the Defendants before the Dubai Court was appropriate according to Articles 21 and 24 of the UAE Civil Procedure Law. In addition, the court rejected the Claimant’s request to apply foreign law because the Claimant had failed to submit a complete and certified Arabic translation of the foreign law. The Court held that the holding of security in respect of the main agreements was an obligation ancillary to the principal obligations and ran parallel to them. As such, the security imposed a personal obligation on the Claimant guarantor to the extent of the amount received by the principal and no more, even if otherwise provided for by the original contract, which stated the value of the bank facilities. The principal debt limited the scope of the guarantor’s obligation, i.e. the scope of the guarantee that must be satisfied on demand. This was also the limit of the creditor’s claim when the borrower defaulted on the payment of his debt to the creditor. The Court found that the Defendants had not demanded payment of the full amounts under the guarantees, which were valid in terms of specifying the guarantee, the principal, the creditor, and defining the scope of the guaranteed liabilities. The guarantees were valid and contained nothing contrary to public policy. The guarantees therefore operated to bring about the legal effects intended by the parties. As such, there was no cause to invalidate the guarantees under UAE law. 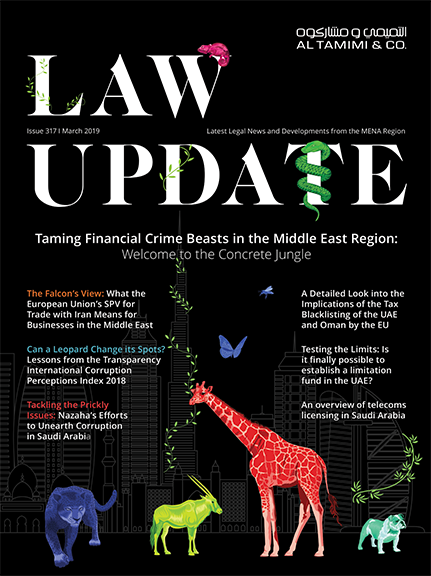 It is rare for the UAE courts to apply foreign law to a dispute in which it can be argued that UAE law is applicable, particularly in commercial transactions. This case provides a good example of the courts considering the application of foreign law if completed and certified Arabic translations of the foreign law are provided. In addition, issues surrounding the applicability of the Vienna Convention in relation to jurisdiction could also have significant implications on how transactional documents are executed. This Court of First Instance judgment is subject to appeal.